Treadstone Intercooler Assembly UNIVERSAL - Dezod Motorsports Inc - Home of the automotive performance enthusiast since 2002. Dimensions 3.5" x 25" x 6"
Dimensions 3.5" x 10" x 22"
Dimensions 3.5" x 18.5" x 6"
Dimensions 3.5" x 12.5" x 9"
Dimensions 3.5" x 12.5" x 22"
Dimensions 3.5" x 7.9" x 22"
Dimensions 3.5" x 25" x 9"
Dimensions 3.5" x 10.5" x 24"
Dimensions 3.5" x 6" x 22"
Dimensions 4.5" x 12.5" x 22"
Dimensions 3.5" x 12.5" x 6"
Dimensions 3.5" x 18.5" x 9"
Dimensions 4.5" x 10" x 22"
Dimensions 3.5" x 10" x 28"
The Treadstone name has become synonymous with quality intercooler’s over the past few years, and we pride our selves on it! We manufacture our bar and plate cores with strict guidelines, and are specifically designed to maximize cooling using the most surface area possible in any given space. Our cores give the perfect balance between heat exchanging efficiency and flow. Our internal fin structure design is top notch, and is where the most important changes can be made to enhance the cooling rate. 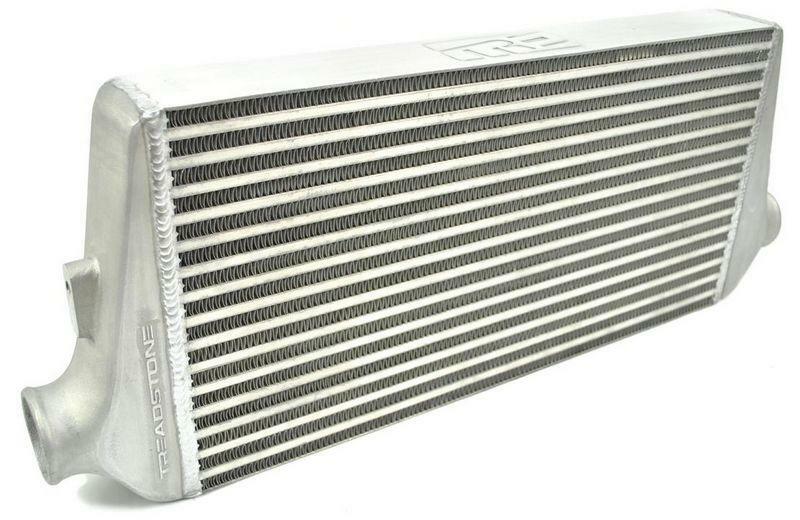 Treadstone intercooler cores feature a high heat-dissipating “Inner fin” design. This is ideal for medium to high boost levels on higher horsepower or upgraded turbo engines. The larger internal surface area provides superior cooling efficiency for radiating excessive heat and minimizing heat soak. In general, these design characteristics is what gives Treadstone Intercooler’s the leading edge in intercooler technology. Treadstone Intercooler Assemblies features superb quality highly efficient bar and plate construction. Our quality cast end tanks ensure evenly distributed airflow and low-pressure drop. Our intercoolers are pressure checked to 150psi and come with a 1-year warranty against manufacture defect. Bar & Plate Intercoolers are proven to be the most efficient air to air intercoolers on the market. Older styles of tube and fin intercoolers just don’t stack up. If your ultimate goal is to cool the Air to the maximum you have to go Bar & Plate.